Carlos Fuente Jr., the lead blender for Fuente, is best known for such power smokes as Fuente Fuente Opus X and Ashton VSG. To make the Rosado Sungrown series of cigars, he looked to his warehouses of well- aged Ecuadoran Sumatra wrapper, taking leaves placed lower on the plant than the ones he uses for the spicy VSG and creating a more sublime and mellow blend. 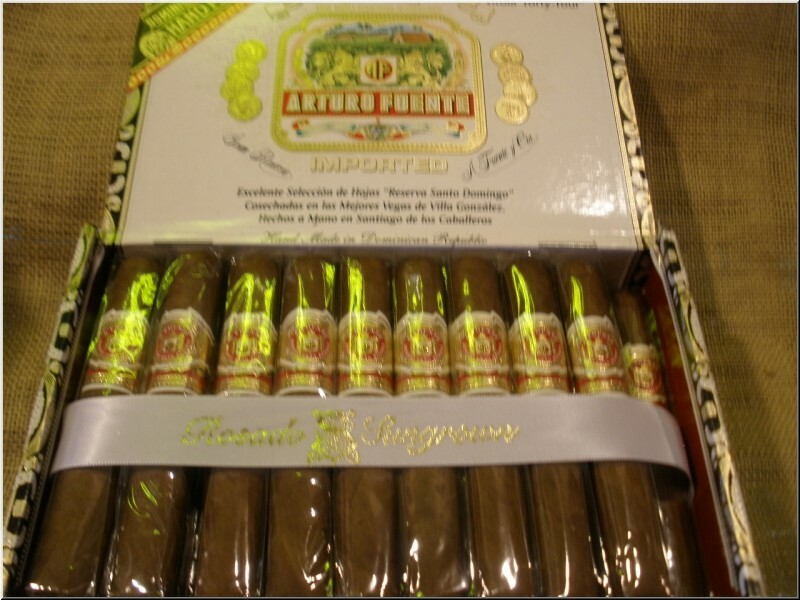 Arturo Fuente Magnum R Rosado Sungrown is a special cigar collection series years in the making intended to stand apart from the rest of the Fuente family of cigars. One look at the decorative gold band and luxe box and you already know what to expect. Rosado refers to its rich reddish color from the mature wrappers. Ecuador Sungrown Sumatra, these rare rosie wrappers are aged for nearly a decade, giving these cigars a sweet distinct finish and elegant undertones of leather, cream, cedar, pepper and roasted pinenuts. The Arturo Fuente Rosado Sungrown Magnum R 54 was named one of the 25 Best Cigars of the Year with an impressive 92 rating. Not too heavy, not too light, but just right. Get ready for something delicious and different in the medium category from the company reserves of premium tobacco at a nice price. Available in the magnum ring gauges everyone has been asking for: the Magnum R 54, Magnum R 52, Magnum R 56, Magnum R 58, Super 60. Rated 94 points and #6 Best Cigar of 2016. The name is certainly long, but it tells you almost everything you need to know about this Fuente cigar. Rosado Sungrown indicates the color and growing conditions of the wrapper leaf. And Magnum refers to the sizes of the cigars in the line. When the brand was first released, all the cigars were fairly thick. But more importantly, this cigar also ran contrary to the industry trend. At the time, many manufacturers in the premium sector were releasing strong, full-bodied cigars. Carlos �Carlito� Fuente Jr. decided to go in the opposite direction and made a cigar that was medium bodied in strength, but still registered as full-flavored on the palate�not an easy task. He accomplished this by creating a particular blend of Dominican tobaccos and pairing it with a wrapper leaf from Ecuador that, according to Fuente, has almost a decade of age. You might assume the cigar is called Vitola �Forty-Four� for its ring gauge, but the �Forty-Four� denotes the number of cigars packaged per box. This cigar is still fairly slim at 47 ring, but it�s a great size, and each puff compels the next with unrelenting layers of spicy cinnamon, dried fruit, nuts and maple. Rated 92. It took a bit of time to warm up, but this cigar gets creamier and richer with each puff, showing an abundance of chocolate, leather, spice and toast flavors. Rated 92. A sublime, balanced and elegant cigar with plenty of sweet wood and earth flavors, just a touch of leather and a sweet finish. Rated 90. Draped in an evenly colored wrapper, this thick robusto draws well, starting with woody, nutty notes that intensify as the cigar progresses.